At first I was psyched, then I was wary. Then, I became psyched again, ignoring any qualms and doubts. After all, in Spielberg, I trust. Psyched, because I was going to revisit my childhood, looking forward to a much-needed throwback to good old-fashioned adventure. John Williams, your score always gave me goosebumps with the first note and helped me escape to an exotic place of danger and wonder. Wary, because I was reminded of last year's fourth installment of Die Hard, a classic franchise that needed to milk out one last hurrah and senselessly update its thrills for a new generation of moviegoers. Mr. Spielberg, you couldn't possibly let me down as well, could you? Now, having just seen Indy 4 last night in Century City with a crowd sharing a similar anticipation, I can say this: Oh. Okay. Hmmm. First thing's first: I'm kind of hating the Internet now. 19 years ago, when we last saw Junior ride off into the sunset after completing his Crusade, such technology didn't exist. Chat rooms never leaked spoilers. Paparazzi pics never revealed or hinted at key plot points to the story. Ongoing speculation never tortured the minds of fanatics once news broke out that the first draft of the script was greenlit by the studio. We just saw a trailer, got all tingly inside, bought our tickets and were taken for a genuine thrill ride we know we'd cherish forever. 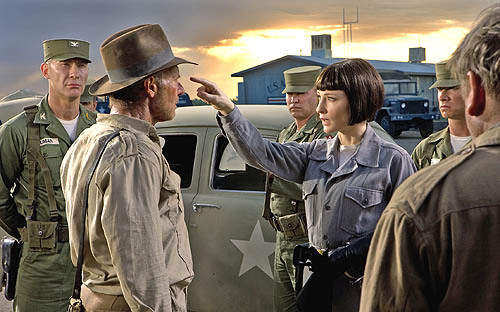 With Crystal Skull, most the mystery, most of the rumors about the film (without spoiling anything) are disappointingly true. Sadly, this fourth installment is nowhere near the caliber of the first three. 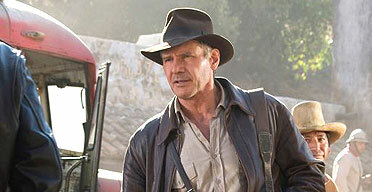 Consider it Indiana Jones's Greatest Hits, a compilation of homages to his previous adventures that unfortunately turns into a sequel to Mom and Dad Save the World. And it's not that it's overly CGI-ed. The film just seems to lack any scope. You feel the artificiality of the soundstage. You're not blind to the green screen. Where are the on-location shots? Where's that breathtaking view of a real-life city trapped in time? Raiders' sweeping Moroccan desert, anyone? Temple of Doom's India? Crusade's Venice canals? Here, we get Crayola-colored jungles where the background seems to run cyclically (think: Homer Simpson driving down the streets of Springfield, the same buildings passing by every three seconds). Here, we get Styrofoam caves decked out in silly string passing for creepy cobwebs. Maybe you can blame the lighting. Half of the movie appears to be too bright and shiny. And Janusz Kaminski, what's up with your cinematography skills, yo? During the past 19 years, we've all grown accustomed to those theme park rides, attractions and stunt shows. We know how it all works, we've seen where the explosions come from and which trapdoor the hero escapes through. Watching Indy 4 feels like that. An audience that has now acquired a taste for the nervy immediacy and close-to-home thrill of a Jason Bourne outing probably won't accept a rubbery-tasting substitute featuring a sextogenerian in a dusty fedora. Maybe Spielberg intended for this to be the ironic, tongue-in-cheek portion of the saga, making fun of itself (Shia LeBeouf impersonates Tarzan in one ridiculous scene - and no, he doesn't don a loincloth). Maybe the man who made Jaws and E.T. and friggin' Jurassic Park for chrissakes thought that we'd get the silliness, that we'd get a kick out of watching him play around in his expensive sandbox with George Lucas and Harry Ford. By all means, still go out and see it. I'm one who hates to dwell on the negative, and there ARE some cool little nuggets in this chapter: Cate Blanchett's scene-chewing villain (Cold War-era Russians are the new Nazis), an exciting car chase through a college campus (look for a shout-out to Marcus Brody), and a fight sequence upstaged by some pesky bugs. I thought we were promised old-fashioned moviemaking (Stevie, what were those online production diaries for?). I thought we were being treated to the movie we were hungry for, but as it turns out, most of us already have those on our shelves at home packaged in a nifty boxed set.